Fatehpur Sikri " The city of victory " was the ancient capital of the Mughal Empire for 14 years . City built by Emperor Akbar between 1571 and 1585. It is said that it was abandoned due to water shortage and because the Agra Fort was much safer, given the constant attacks of his rebellious son. Today its structure is kept in perfect condition. But who was Akbar? He was Emperor of the Mongol Empire at the age of 26. A kingdom that extended from the Himalayas to the end of the Indian subcontinent (India, Pakistan, Bangladesh, Nepal and Bhutan). Concerned that he could not have an heir to his empire, he went to the hill of Sikri to consult the Sufi saint Salin Chishti, who resided there. It is a huge space, which will take several hours to see (when you enter the area of ​​the mosque you lose the notion of time) and that as happens with Agra Fort. This is the area where the palaces, courtrooms, as well as the Diwan-i-Aam and Diwan-i-Khas buildings are located . It is the area where we can see the structures and buildings in perfect condition, besides being paid, it is very quiet and will allow us to get away from the bustle of the streets of India for a few hours. The printed guide and several articles from other travel blogs we documented on the fly, of what we were seeing in and what each building meant and in general Fatehpur Sikri. Akbar Pavilion, with a large courtyard that was used for public audiences . Surrounded by roads that were once filled with shops and stalls in a bustling city. The simplistic design of the Diwan-I-Aam shows us another side of the emperor , in which we find the philosophy that gave rise to the principles of Din I Ilahi , religion that the emperor Akbar founded and popularized. Din I Ilahi , was a religion that tried to unite the best of all the religions of the world , taking elements of Islam, Christians, Hindus, Jains, Sikhs and Zoroastrians. The religion died, when he did it. It is the famous pavilion of Akbar’s private audiences . Square building, very easy to recognize for its 4 towers in each corner and being, possibly, the most photographed of the civil zone. The Diwan-i-Khas can be entered to observe the details of its interior and its central pillar, which supports a circular platform. Akbar’s queens and their servants gathered here to play parchis . It is a palace with 5 floors, open on each of its sides to fight the high temperatures of Agra. A few meters from the Diwan-I-Khas, we find another patio where there is a pond with a walkway that leads to a platform in the center, where the musicians played for Akbar . The whole civil area was full of local tourists, who strolled as a couple or families quietly taking pictures and many selfies (yes, with us too). Interestingly, the tranquility is over when we enter the religious zone . The religious zone of Fatehpur Sikri, is the zone of more transit , atmosphere, merchants and of course, religious. Unlike the civil zone, entering here is free , which explains the return to bustling and never boring India . The main attraction is the great Jami Masjid mosque , although we can also find the great Buland Darwaza gate and the tomb of Sheikh Salim Chishti. The Great Mosque, 165 meters high, is one of the largest in all of India . You do not get to appreciate the surroundings and the history of the place, since there is not 10 seconds of peace in the whole enclosure, to stop and look around you. Also, checkout the Palace on Wheels train cost before planning the trip. Like all Mosques, it is necessary to take off your shoes. In this case, they will warn you that you can not take pictures , but where the law is, there is the trap. 54 m high, it was built by Akbar after the conquest of Gujarat in 1573 and is the most impressive monument of all Fatehpur Sikri. Dozens of local tourists and merchants are at your doorstep trying to sell you a tray of freshly peeled fruit, a postcard of Fatehpur Sikri or a chessboard; anything tangible is salable. From its doors and looking towards its stairs, you can enjoy a perspective of the new Fatehpur Sikri, with views of the entire city . Small construction in white marble in front of a pond, with dozens of people queuing to see the tomb of the famous Sufi saint . In this case I did not enter, I preferred to stay enjoying from the environment and taking some photos. 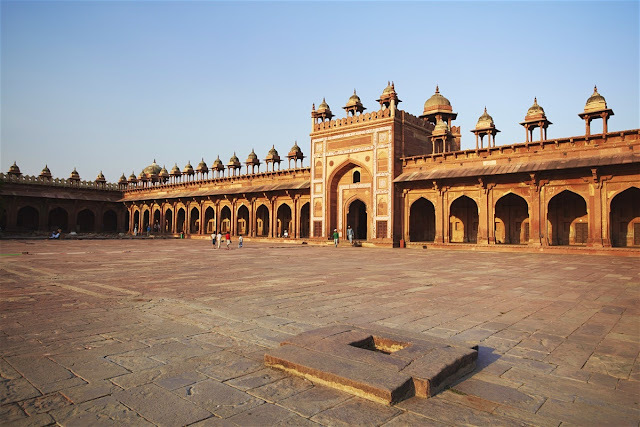 How to get the Fatehpur Sikri? We were careless in our whole adventure through the Rajasthan of "how to get" to the sites, since we always went with Pooran and his Suzuki. Agra : By bus, from Idgah station in Agra. They leave every 30 minutes and are worth 100 rupees. You can also negotiate the price with a tuktuk on duty, so you live an authentic experience, although somewhat slower. Jaipur : You can be reached by bus, train and private vehicle. The fastest is the train, due to the poor condition of the roads, although the most comfortable is the private vehicle. Other ways to get there : You can also get there from Agra by train . From what you intuit that it will be possible from many other destinations that have rails in India. You can also opt for taking luxury train Palace on Wheels which offers five star facilities onboard the train.